The third book in the series continues on the odd parallel path with the TV series. In a way, it reads as an alternative treatment of the television material. Despite Jonathan Frid appearing on the cover of later editions, Barnabas is nowhere to be seen. This book is all about a mysterious room that is occasionally occupied by a visiting relative. The room contains a secret that has been kept for years by the old relative and his equally elderly servant. The book would have been better if the flashbacks had been genuinely set in the 1920's. Instead, they are told as first person accounts in dialogue between characters. The book does not require any knowledge of the television series or the previous books to enjoy. Yet another paperback in the early part of the series that has Barnabas on the cover when he has not even yet made his appearance in the book series.Victoria is obsessed with finding out who her real parents were. She still thinks she's a Collins, and when a very ill and very old Henry Collins comes to basically die, and befriends her, she thinks she might be his grandaughter. A gift of a valuable necklace just builds her belief she's related to him.Carolyn is off working and living with a girl friend, and David is at a boy's camp, so that conveniently gets those two characters out of the way. Roger drinks as much as ever and he's as rude to people as ever.Roger hates Uncle Henry. Benjamin is an old companion to Uncle Henry. Benjamin has a rather poorly behaved son who is there with him.Uncle Henry lives in a specific room which ties him to a specific woman in his past. She died at Collinwood. Victoria looks just like herThere's the usual Victoria-has-someone-trying-to-kill-her plot and she still has not learned never to go down into the wine cellar alone.The books are basically repeating themselves at this point. Someone moves in to Collinwood. For some reason they, or their underlings, trying to kill/at least injure Victoria. Burke Devlin helps her look into the matter. The evil doers are found out. Victoria screams a lot and does all the wrong things, putting into constant danger.There's some kind of major change needed in the series. This book continues the storyline already established in DARK SHADOWS and VICTORIA WINTERS. 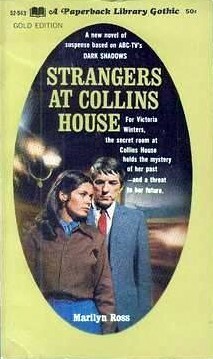 In STRANGERS AT COLLINS HOUSE, governess Victoria Winters continues to search for clues to her parentage. She is befriended by Elizabeth's uncle Henry Collins, a strange old man who (Victoria hopes) may turn out to be her grandfather! Henry, many years ago, was in love with a New York showgirl named Winifred Ray that Victoria closely resembles. But back in 1916 Winifred was found murdered in a dark alley, while Henry's consumptive wife languished in a hospital bed! The police never solved that crime and now, fifty years later, Victoria may have to figure out the puzzle for herself...This is a good read, better written than much of the series. There's a Scooby Doo (i.e., not real) apparition featured here, with poor Victoria menaced at every turn. There are the mysterious mistress of the house, Elizabeth, and alcoholic Roger Collins. There's a secret room that may be haunted---Victoria thinks it is---and a ghost hunter who conducts a seance there. This little book captures the very spirit of the creepy TV show, and that's primarily what readers expect from a Dark Shadows novel. Set in the time period before Barnabas Collins joins the show. An elderly relative, Uncle Henry, comes to visit the family with his long-time man-servant, Benjamin, and two other servants (Ben's son and daughter-in-law). In preparation for his visit, Victoria Winters is shown the "Hidden Room" by Elizabeth Stoddard; this room is a room that remains locked when Uncle Henry is not there and is the re-creation of a room from a fancy New York hotel that had been demolished that Uncle Henry adored. It was the last room where had been happy in and the last room where he had seen his true love ... alive. Then a ghost starts to appear to Victoria after Uncle Henry gives her a secret gift. Not much supernatural to the book but an enjoyable read, especially for fans of the series. This is the 3rd book in the Dark Shadows series. Victoria Winters is still looking for her identity. She was brought up in an orphanage. She thinks she is part of the Collins family. She got to meet a man who she thought might be her grandfather. He died and she found out she had been wrong. So, she is still looking for family. This story had a ghost and a couple attempts on Victoria's life. It kept my interest all the way through. Looking forward to the next book. Mysteries and dark shadows everywhere. Not the most interesting book, but it was fun revisiting the Collins household for a while. Good addition to the Dark Shadows stories. Marilyn Ross - William Edward Daniel Ross, W. E. Daniel "Dan" Ross (born 1912) is a bestselling Canadian novelist from Saint John, New Brunswick who wrote over 300 books in a variety of genres and under a variety of mostly female pseudonyms such as Laura Frances Brooks, Lydia Colby, Rose Dana, Jan Daniels, Ross Olin, Diane Randall, Clarissa Ross, Leslie Ames, Ruth Dorset, Ann Gilmer, Jane Rossiter, Dan Ross, Dana Ross, Marilyn Ross, Dan Roberts, and W.E.D. Ross. As Marilyn Ross he wrote popular Gothic fiction including a series of novels about the vampire Barnabas Collins based on the American TV series Dark Shadows (1966-71).